Own import from the farmer to your home in own management for you! This nut occurs in the natural environment of the gray redstart and is the main component of the daily diet of this species. 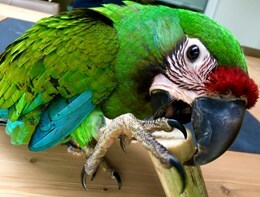 The palm nut fits perfectly in the daily diet of your bird. We see that youngsters who are just going to eat independently have an orange head (from the carotene) left over from the cuddling, but this has completely disappeared the next day.